Antibacterial, antiviral and clearing. Organic Ravintsara Essential Oil (Ex Ravensara) has powerful antibacterial and antiviral properties that can be used effectively to prevent infection and combat the effects of coughs and colds. Inhaling its vapours clears blocked sinuses, loosens phlegm and catarrh, and soothes spasmodic coughs. It has earned a reputation as being the most effective essential oil for treating herpes and shingles, and is highly anti-infectious. Ravintsara is the essential oil first described in the ground-breaking aromatherapy book ‘L’aromatherapie Exactement’ by Pierrre Franchomme and Dr Daniel Penoel, released in 1990. Although the authors stated it was derived from Ravensara aromatica, the chemical profile they provided in the book makes it clear they were actually describing an essential oil obtained from a different species that has only recently been correctly identified and taxonomically re-classified as Cinamomum camphora c.t. cineol. The essential oil from this species is known as Ravintsara. Obtained from the leaves of a tree native to Madagascar, Ravintsara Essential Oil has a sweet, soft camphoraceous and herbaceous aroma, with woody back-notes that make it similar to, but softer than eucalyptus. It is an excellent nerve tonic and can be used in massage blends to restore the body’s depleted immune system. 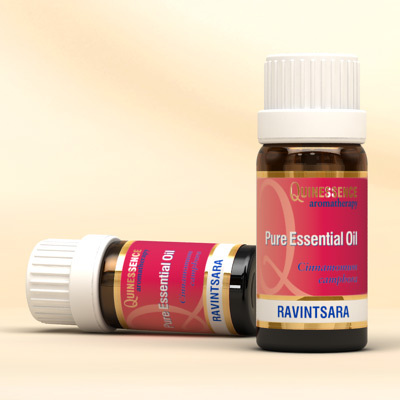 Please see the information below for further clarification about the differences between Ravintsara and Ravensara essential oils.